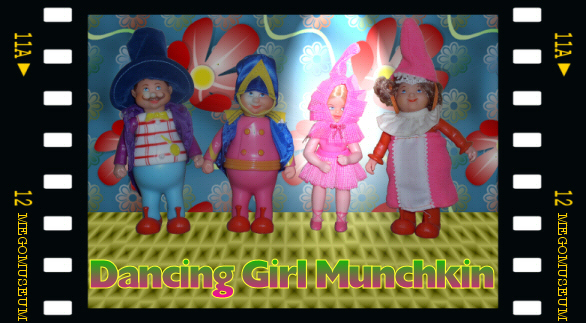 Munchkin Dancing Girl (Item No. 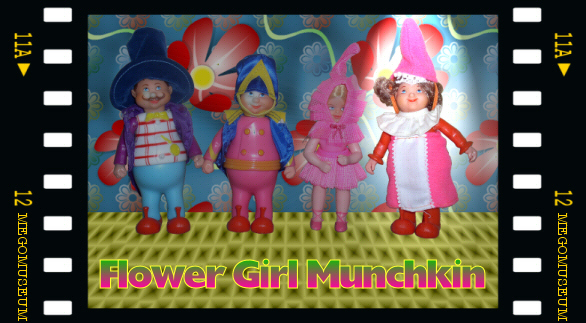 51502/3): The third in the line of Mego Wizard of Oz Munchkins, this item recreates the character of the Munchkin Dancing Girl from the film. The figure’s body is absolutely unique, and is made up of a pair of rubber flesh arms (bent at the elbows), a pair of rubber flesh legs (reinforced with internal wire) with ballet slippers painted in pink on the feet, and a hard plastic torso cast in pink. The figure’s outfit is a skirt and oversized cowl, both made from a fine pink tulle with a white netted overlay. 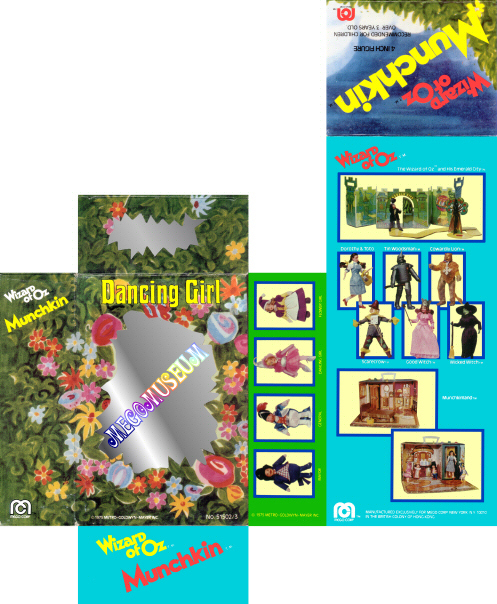 Package Variants: The Dancing Girl came in only one style of package. Figure Variants: There are no known figure variants for the Dancing Girl. Reduce, Reuse, Recycle: The packaging for all four of the Munchkins is virtually identical. All four inserts are exactly the same, and the only difference in the outer packaging lies in the figure name and Item No., both on the front panel. Girl, be sure to check and make sure that she has her plastic “hair sleeve” on under her cowl (just because she’s half-size, Mego didn’t skimp on the hairdo accessories–and she isn’t “complete” without it). Finally, be careful when displaying a loose Dancing Girl, as her rubber-like body material can melt after prolonged contact with the wrong kind of plastic (any Liddle Kiddle collector will readily attest to this unfortunate chemical reaction). Click on the icons above to view detailed scans of the Dancing Girl’s Box and Box Insert! Above is an example of a mint-in-box Dancing Girl. and a white “clown collar” tied at the back. Package Variants: The Flower Girl came in only one style of package. (again molded in different colors). the rubber bands that hold the Flower Girl to her insert are almost always broken or rotted away. Most collectors don’t really care about the presence or absence of a couple of tiny rubber bands, and understand that time takes it toll on everything, even packaging elements; however, should you stumble across a specimen that still has its bands intact, kudos to you, as these are certainly more desirable. Additionally, the elastic band on the Flower Girl’s hat can become easily stretched out, so be careful not to strain it unduly. Finally, when buying a mint-in-box Flower Girl, be sure to check and make sure that she has her plastic “hair sleeve” on under her hat (just because she’s half-size, Mego didn’t skimp on the hairdo accessories–and she isn’t “complete” without it). Girl’s Box and Box Insert! Above is an example of a mint-in-box Flower Girl. Munchkin General (Item No. 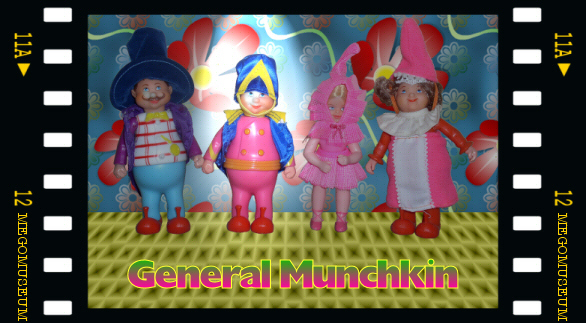 51502/2): The second in the line of Mego Wizard of Oz Munchkins, this item recreates the character of the Munchkin General from the film. The figure’s outfit is represented mostly by molded-on or painted-on detailing to the body. The figure has pink pants, red shoes, pink arms (with a yellow inverted “V” painted at each wrist, and the hands painted flesh), and a pink torso with buttons and cummerbund molded on, both detailed in yellow. The ensemble is completed by the only two cloth portions of the figure: a blue, satin hat with a flocked, yellow inverted “V” on the front and an elastic band to secure it under the chin, and a blue, satin sleeveless jacket with a flocked, yellow collar. Package Variants: The General came in only one style of package. Figure Variants: There are no known figure variants for the General. Reduce, Reuse, Recycle: The packaging for all four of the Munchkins is virtually identical. All four inserts are exactly the same, and the only difference in the outer packaging lies in the figure name and Item No., both on the front panel. Also, the General and the Mayor both have the same arms (molded in different colors), and the General, Mayor and Flower Girl all have the same legs and feet (again molded in different colors). Caution Collectors: The General was manufactured around the time that Mego began using a lower grade of plastic for the heads of their figures. As a result, the General (as well as the other three Munchkins) is extremely susceptible to “graying” of the face, so try to keep him out of direct sunlight. Also, the rubber bands that hold the General to his insert are almost always broken or rotted away. Most collectors don’t really care about the presence or absence of a couple of tiny rubber bands, and understand that time takes it toll on everything, even packaging elements; however, should you stumble across a specimen that still has its bands intact, kudos to you, as these are certainly more desirable. Finally, the elastic band on the General’s hat can become easily stretched out, so be careful not to strain it unduly. Click on the icons above to view detailed scans of the General’s Box and Box Insert! Above is an example of a mint-in-box General. 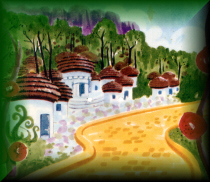 Munchkin Mayor (Item No. 51502/1): The first in the line of Mego Wizard of Oz Munchkins, this item recreates the character of the Munchkin Mayor from the film. The figure’s outfit is represented mostly by molded-on or painted-on detailing to the body. The figure has light-blue pants, red shoes, purple arms (with the hands painted flesh), and a white torso with buttons, pocket watch and bowtie molded on; the tie and watch are detailed in yellow, while the entire torso front is detailed in red intersecting lines, giving the impression of a plaid waistcoat. The ensemble is completed by the only two cloth portions of the figure: a blue, velveteen top hat, and a purple, nylon jacket (sleeveless, as the purple plastic arms create the illusion of sleeves). Package Variants: The Mayor came in only one style of package. 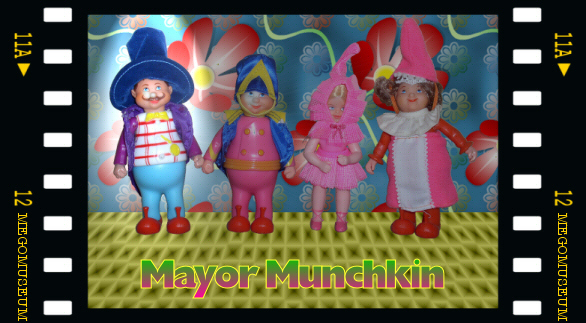 However, the Mayor figure was also included in the Mego Munchkinland Playset. Figure Variants: There are no known figure variants for the Mayor. Reduce, Reuse, Recycle: The packaging for all four of the Munchkins is virtually identical. All four inserts are exactly the same, and the only difference in the outer packaging lies in the figure name and Item No., both on the front panel. Also, the Mayor and the General both have the same arms (molded in different colors), and the Mayor, General and Flower Girl all have the same legs and feet (again molded in different colors). the rubber bands that hold the Mayor to his insert are almost always broken or rotted away. Most collectors don’t really care about the presence or absence of a couple of tiny rubber bands, and understand that time takes it toll on everything, even packaging elements; however, should you stumble across a specimen that still has its bands intact, kudos to you, as these are certainly more desirable. Did You Know? 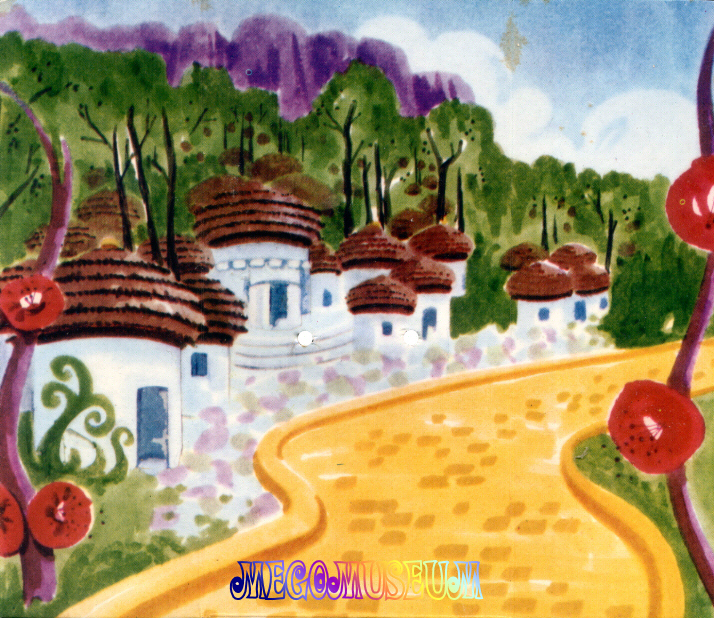 : The Mayor is marginally more common than the rest (due to his inclusion in the Munchkinland Playset), and therefore worth slightly less than the others; however, as rare as the Munchkins are, the mint-in-box Wizard still has them beat by a mile. Click on the icons above to view detailed scans of the Mayor’s Box and Box Insert! 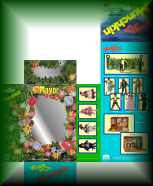 Above is an example of a mint-in-box Mayor.